Have you seen how expensive things have gotten lately!? Everything is so high now...especially greeting cards. I love to create, and have started creating my own cards. A friend of mine is getting ready to get married, and I wanted to make the gift look special, so I not only created a card, but also hung a Louisiana themed Christmas ornament I made from old guitar strings, on the package. Another friend of mine is moving...sadness...anyway I made her a necklace and then made her a card. These envelopes are very easy to make. I like to add cut-out flowers using a complimentary paper. For the actual card, I use opposite paper. 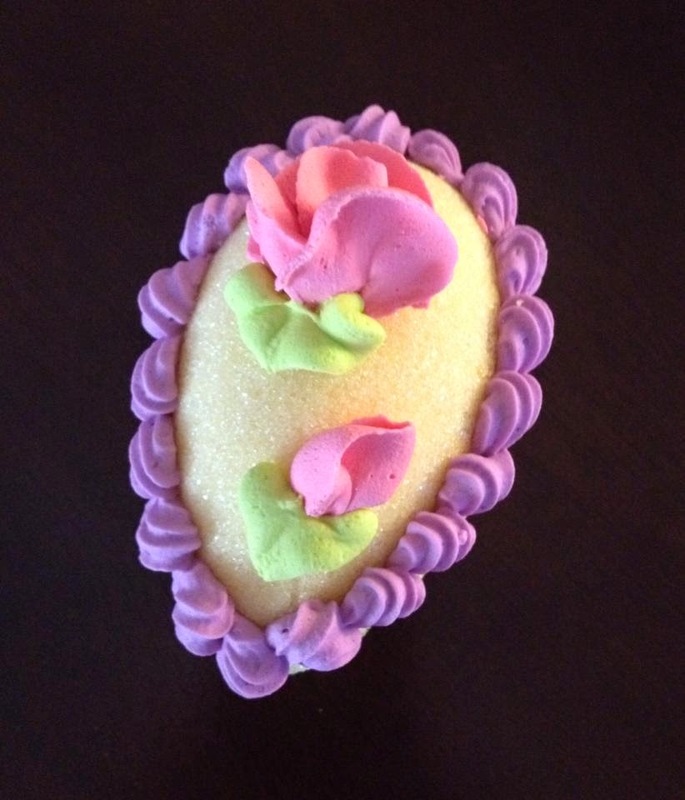 These are actually very easy to make...hmmm, maybe I should do a tutorial on this? John Shaw's Guide to Digital Nature Photography, is a book filled with over 250 gorgeous photos of the outdoors. This book explains how to capture magnificent pictures just like he does. He starts by telling you about all the different things there are to photograph. Mr Shaw proceeds with what type of gear you need, and then on to more details of the act of capturing those incredible nature shots. I love photographing everything, especially nature. I am a beginner photographer, and have had a hard time understanding my camera's settings. A lot of my beginner photography friends have the same issue. This book explains everything you need to know about settings and how to use them, and I will be honest, looking over them and reading about them in this book, I am still confused. But...I am a "hands on learner." He does, though, tell you the settings he used to take each of these beautiful pictures. Mr Shaw does explain ISO, F-stop, depth of field, metering, shutter speed, and pretty much everything one needs to know; he goes over A LOT of stuff! But, as I said before, one needs to know their camera; in other words don't expect to know nothing and have this book help. You do need to know something about how to work your camera. You will enjoy looking at the pictures though! I plan to set this book out on my coffee table for people to look out. I grew up in a house full of girls. My dad was the only male with three daughters and a wife. Even our dog, Bridget was a girl. Daddy use to call every day during his lunch break to see how things were going. During the summers, when we were all home, he had to talk to us for a bit before he knew that it was not Mom. He could never tell us apart. Funny thing is, us girls grew up and had a mess of boys...except the one bonus girl...who happened to be my second child. Anyway, whenever I call home and all the boys are there, I think I know how my daddy felt. I, too have to carry on a little conversation before I can figure out who answered the phone. I was shopping for a swimsuit for my grand daughter. I saw two I really liked, but was not sure as to the size to purchase. You see this suit is for the end of this summer, which still is several months away. I called my mom, and we had a conversation on the size. I also described them both to her and she told me which one she thought would be nice. I told her I would call her when I got home. Ten minutes later, my phone rings....note I am still at the store. It was my mom. Confused, I answered the phone and she started talking to me like we had not spoken today. Then she proceeded to tell me that my sister called and was at the store buying a swimsuit for my grand daughter. I was a little puzzled. Now, I know that sometimes us girls in the family tend to do very similar things and pick out like stuff, but I really found this very odd. Mom described the two suits that "my sister was having a hard time choosing between." She told me that they discussed the sizes too. "Mom! Mom, that was me you were talking too." Mom then says, "Oh funny, you are looking at swimsuits too? Tracey has a pink one with a tutu....." Pretty much she related our conversation back to me, thinking it was between her and my sister. I continued to chuckle. Finally, I got her attention, and told her...again..."Mom, that was me you were talking to." Silence on the other end.....And then she started to crack up. We both had a good laugh. So, no, I guess it will never go away. The Pool Table Is Up!!! For those of you who follow my blog, this table might seem a little familiar. 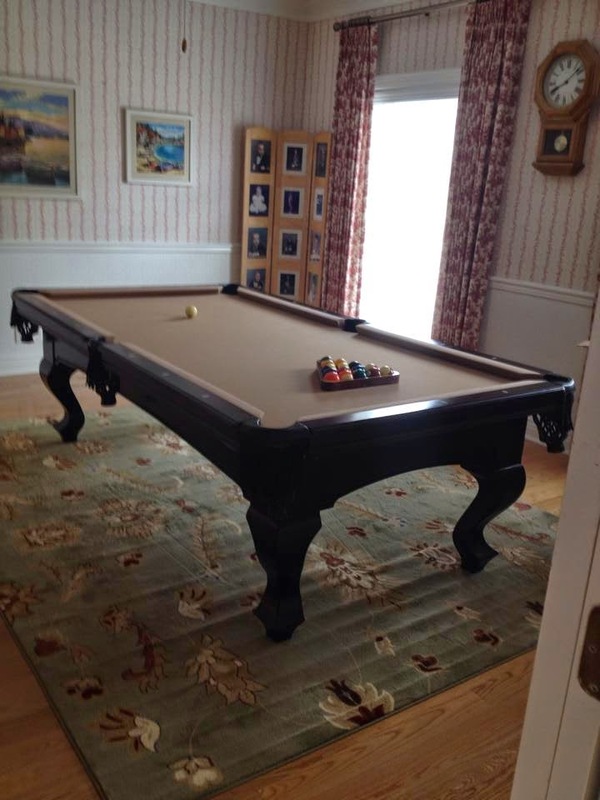 Yep, we never did sell it, the pool table came with us, and we just got it all set up...as in minutes ago the guy left. Slowly, we are getting settled in our new home. We still have a lot to do, like take down wallpaper, paint, etc...but that is going to have to wait awhile. As in several months, maybe even close to a year or maybe so. Still have sorting and boxes to go through. I am down to the nitty gritty, but I am taking time out to get ready to have some peeps over. Next week, we will be having 20 something year olds for fun, food, and fellowship. There will be billards, of course. Also we will have TONS of board games to choose from. Hawaiian Haystacks are on the menu, along with some yummy dessert treats. Stay tuned for an upcoming tutorial on how to make these fun things. The Fish Extender Is DONE! Ok, a little explanation here. My mom, two sisters, and I are going on a girl cruise. At first it was just my youngest sister and myself that were going to do the Fish Extenders. Little by little Mom and middle sister joined in (yay!!!). Since we are four different households, I wanted everyone to take their bag home after the cruise, so I decided to make them individual and then hook them temporarily together. I think they might be too long though, but since I am attaching them with clothespins, I think I can adjust the length, just hope they stay attached. I may temporarily stitch them together instead of using the clothespins. I don't know...what you do think? Any ideas? Don't you just love this fabric? I can't remember where I got it, but I've had it for years. I think someone gave it to me. It was perfect for this project. The back is left over burlap from my son's wedding. I added a bit of lace, ribbon and ric rac on the handles of a couple of the bags. I also added some trimming from a piece of lavender fabric that had colorful dots on it. My youngest sister never has been a lace fan. Even when she was a little girl she didn't like it..."It itches!" She got a Plain Jane one. I know she will like it though. Heck! It has Goofy along with Mickey and Donald on it, and she loves Goofy! The last thing I had to do was figure out how to personalize each one. I started digging around my letter beads, and guess what?! I had enough letters for all our names. AMAZING! Then I just flanked our names with Mickey beads and glued them onto the bags. Hindsight, I should have made them a little wider and not as long, but, oh well. Today, as I scrolled down my facebook, I see this. 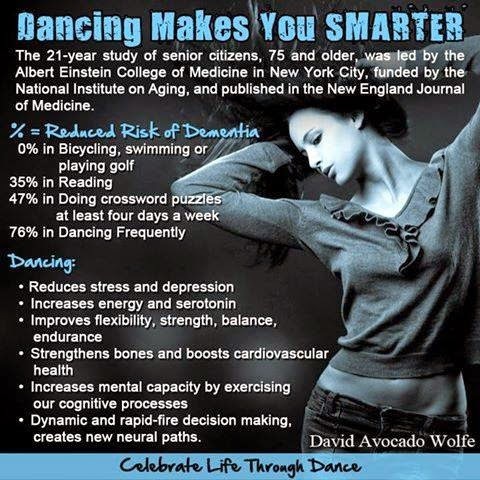 I always knew dancing was good for you in every way, and this study proves it! 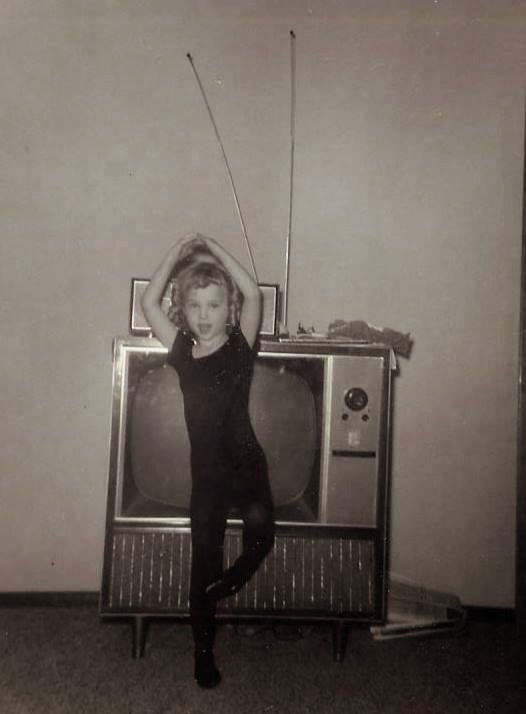 I've been dancing since I was three, and have always loved it. I love the way it makes me feel; energetic, happy, etc. I have tried to keep active over the years, and many of the things I learned to do as a dancer, I try to keep doing now. Ya know what? At the age of 55, I can still do the splits! And even though I could stand to loose a few LB's, my core is pretty strong. Not understanding that one, but, yes, I have really good balance, and I contribute that to my core; and I contribute my core muscles and the know how in balancing, and flexibility to my dance background. As far as mental capacity, it is so true that dance can help with that. Learning a sequence of steps, for example, helps one to develop memory. 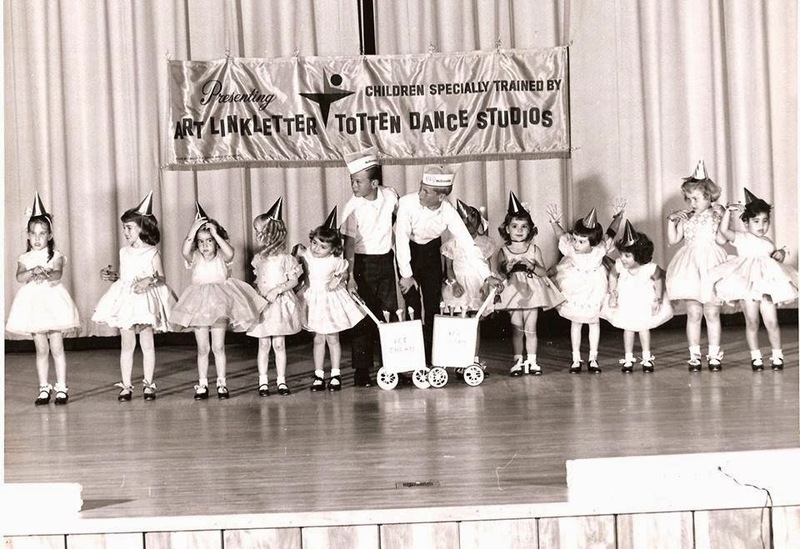 This is a picture of my first recital. I am the one third from the left looking away. I am almost four here, and I remember that dress. It was green, my favorite color, and I loved it. We did a tap number to "The Ice Cream Man." I am grateful that my mom took me to dance classes and am thankful that I've been able to be a part of dance my whole life. Now, my daughter has followed in my footsteps with the love of dance. She is much, much better than I ever thought to be, and love to watch her in motion. 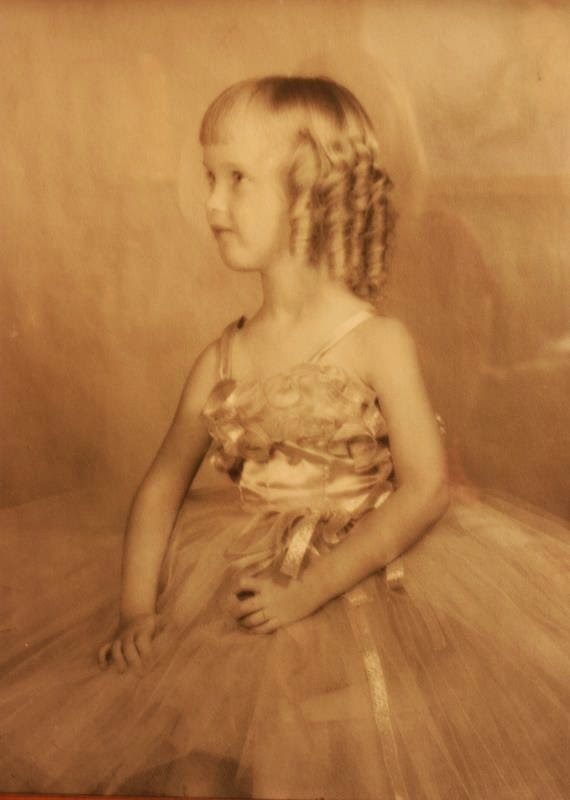 Now we have a new little girl in our family, my grand daughter (my daughter's baby), and it will be interesting to see if we have yet another generation of little girls taking classes and loving dance. 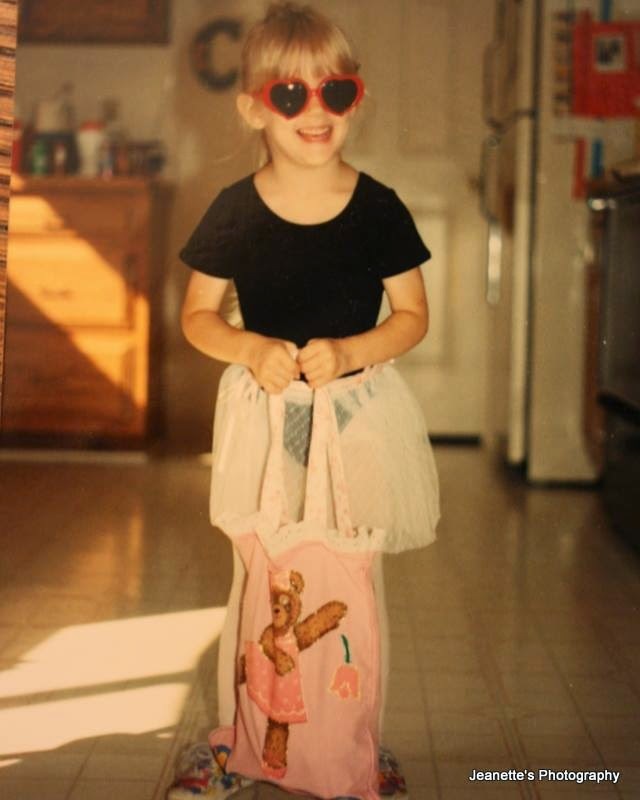 My daughter ready for her ballet class so many years ago. Melissa also gives you time saving tips in the Kitchen Strategy section and the Entertaining Strategy boxes help you to learn to stretch your food and maybe even give your dish a little spin, as in stepping it up a notch or two. Many of these recipes are healthy and call for ingredients that are easy to find in YOUR neighborhood store. Melissa D"Arabian is a well known Food Network star, who has a family to feed at home. Her recipes are family friendly, and also Mom friendly, because they are easy and delicious. Healthy is the key word in the title of this book, but taste and satisfaction are not compromised. , "I received this book from Blogging for Books for this review." Here is a video on how to make a messy bead that you can use as a pendant, or bead itself. Here is an up close view of the pendant I show in my video. I plan to use this and more that I make like it, in a necklace. When I get it done...I'll post. Check out my Treasures by Terry Facebook. We have been looking for a fridge forever, it seems; and during this time our old one has been in the garage...it has been a pain in the you know what, hauling stuff back in forth. When we moved to Kentucky 2 1/2 years ago, we had asked for the fridge to stay. During inspection, we found that it did not work, so we were given an allowance to buy a new one. I loved that fridge. It was one of those side by sides with the freezer at the bottom...and it was BIG! I was sad that our buyers asked for it, and we had to leave it. As we have been looking lately to buy a new refrigerator, we have found they have gone WAAAAY up in price :P We also found that a lot of the them were too big; and the ones that did fit, were $500 more than the bigs ones. Not sure why. We narrowed it down to two, one was a stainless, small version of our one in Kentucky, and the other was a small version of what we already had. 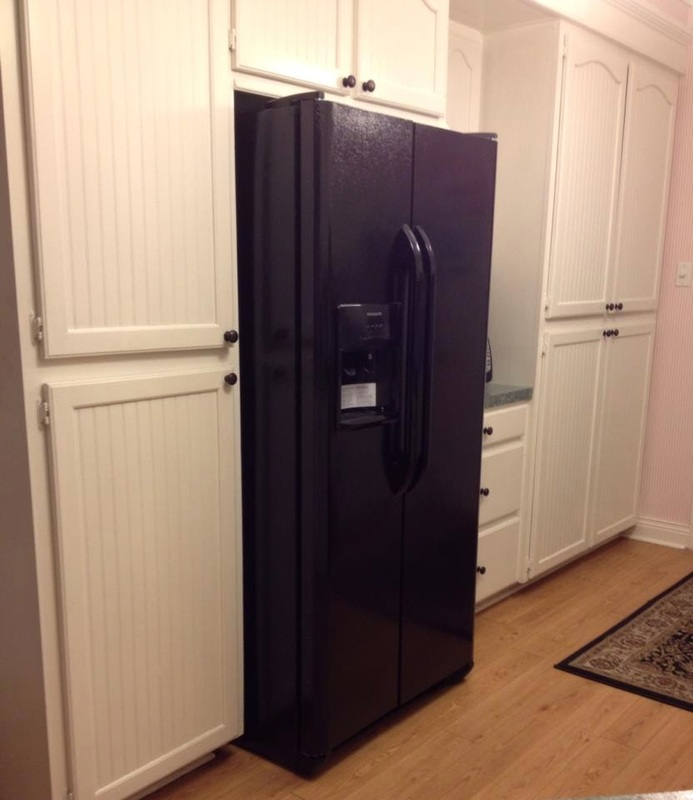 In our current kitchen, we have a black oven/stove and a white dishwasher, so I really did not want a third color in there, so we decided to get the black one, besides the black fridge was $400 less. I'm so glad I don't have to make trips back and forth from the kitchen anymore.